Wash palak, put it in a pot,add salt and water, boil until just soft. Keep aside. Heat 1 tbsp butter in a another pot, add jeera, garlic, cinnamon, green chillies, and onions, braise till garlic and onions turn golden brown. Put this in grinder with boiled palak (dont throw away the water in which the palak is boiled, you can use it for grinding or cooking). Grind into smooth paste. Heat the remaining butter in a pot, add palak and paneer cubes, reduce the heat and cook for 15 mins. Add milk, and cook again for 10 mins till thick. Garnish with onion rings and slitted green chillies. Serve with jeera rice or parathas. Thanks fatma, this dish turned out well. I blanched the palak, green chillies and salt. Then let it cool. In a pan I put jeera, cinnamon stick, onion, garlic and sauteed, added some chopped tomatoes and tomato puree. Let it cool and then pureed it with the palak. I heated oil in a pan and semi fried the paneer cubes and then added the pureed palak-onion mixture. I did not add water, and it turned out quite tasty. Thanks again. We can add tomato as well for further good taste. Great receipe!! but i m a bit agree with jaya that we shud put some tomatoes to make it more delicious!! grt recipe... i added cream instead of milk!!! and it tasted all the more better..
instead of boiling palak ,just light steam it and grind it to paste and you will have the nutritional value intact. 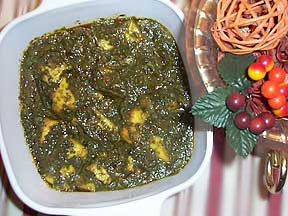 baking of palak with paneer till 15 minutes will make the paneer into RUBBER !! maza aa gya kya recipe hai,try it it is very easy. there is no " khatta element " in the recipe. either tomato or curd should be used. To take better advantages of palak when boiling do not add water because Plak already have lot of water in it.